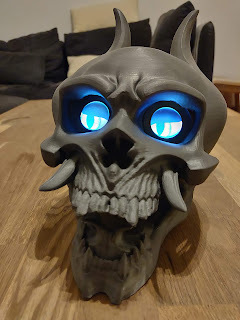 As teased in my article about 3D printing - used existing models, I was printing a skull to combine with some displays to make him somewhat alive. So actually, this is one of my projects, where I combined 3D printing and electronics. 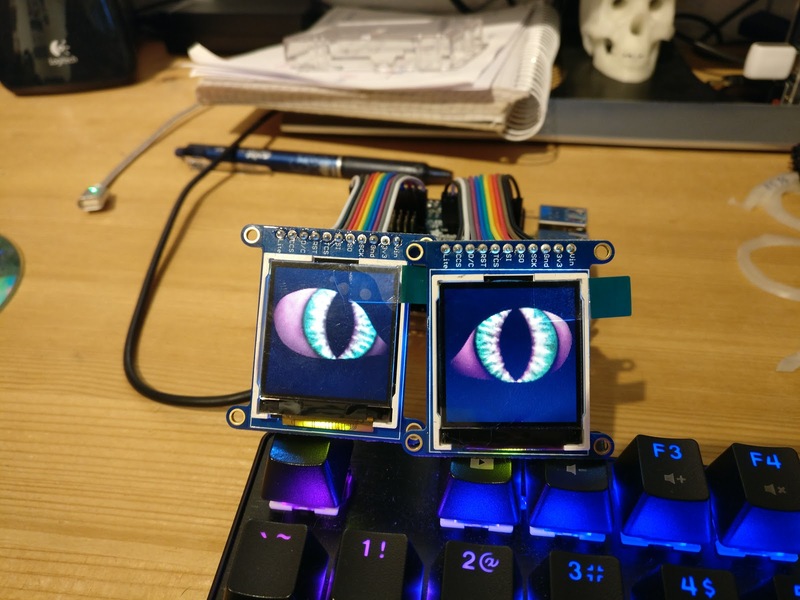 I used this Animated Snake Eyes Bonnet for Raspberry Pi. Actually, I bought it a while back and was looking for a good model to place the eyes in since then. 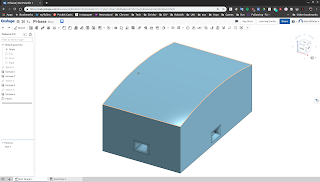 The linked page describes very detailedly how to build it and set it up so I am not going into details here. First I was testing it with a Raspberry Pi Zero W, but the animation was stuttering. Means, more processing power was required. So I went for the new Raspberry Pi A 3+ as it has the same power as the 3 B+ but a smaller footprint, which comes in handy by trying to place it into an object. The first setup for the eyes, they are working. I was looking for a good skull model for quite some time and did some test prints with models I found. Either they didn't turn out quite as well as I hoped or they did not offer enough space to place the eyes (and other electronics). 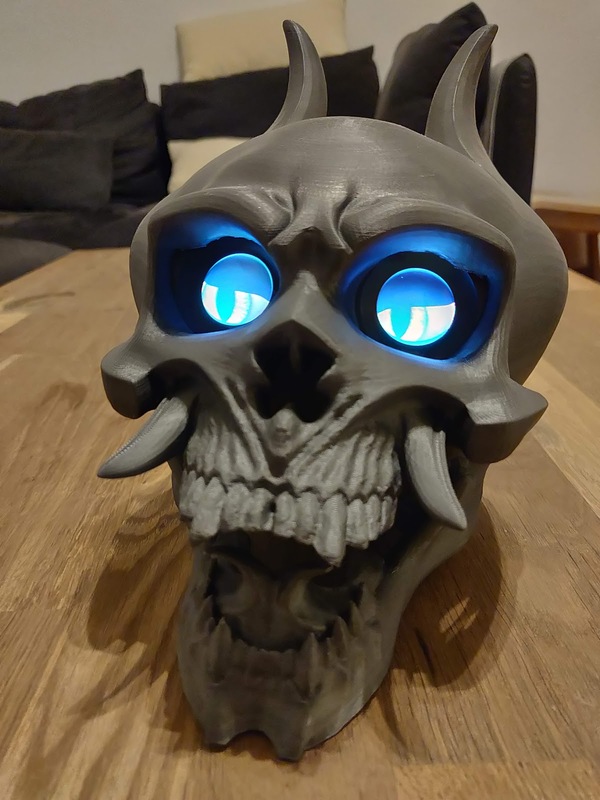 When I was happy, I printed the skull and tried to place the eyes into it. I soon realized that I had printed it a bit too small. The eyes only fit in in a way that they where facing in a wired angle. Means, I printed it again, a bit larger this time. The eyes now fit a lot better into it. 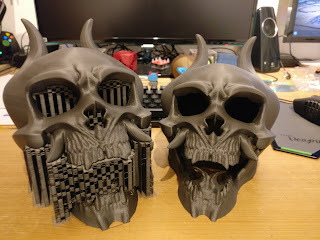 The first and second skull in size comparison. The size was a lot better now. The eyes would fit into for sure. 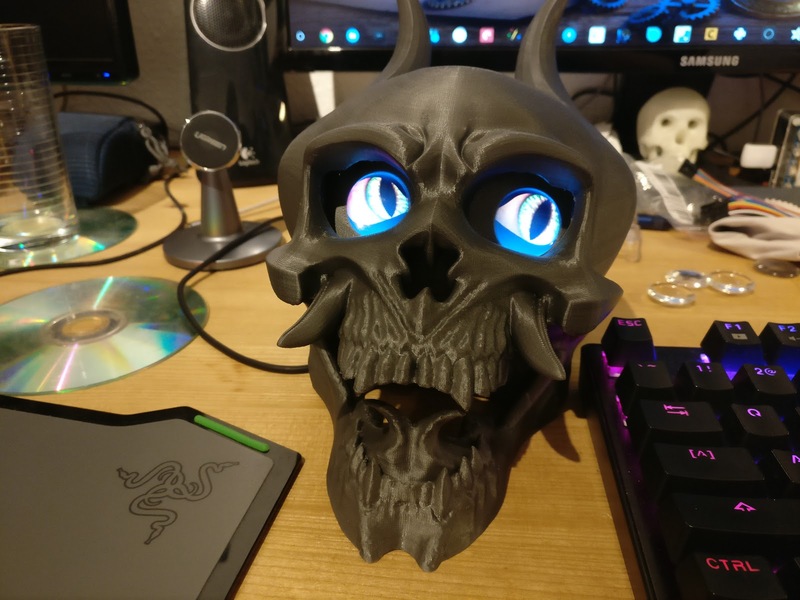 But now I had to create an adapter for the eyes so the display would fit in from the backside and the adapter itself would fit nicely into the skulls eye holes. To get that done, I designed an adapter for the displays first and adjusted it in a few iterations to fit into the skull as well. 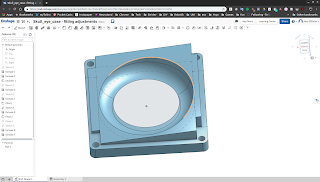 Further on, it should also hold a lens over the eye animation at the displays to give them a bit more of a round, three-dimensional look. The iteration of display adapters (first to last is right to left). 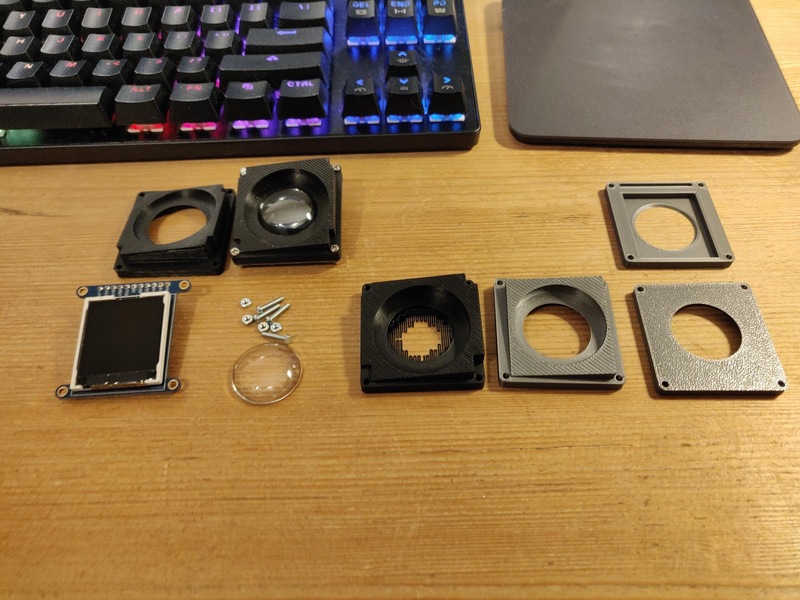 At the picture above, you can see the iterations of the adapter from the first version (right) to the last one I am using now (left) as well as the displays and the lenses, I wanted to use. I was also creating them with an angle so they better match the skull. In the end, they snap fit into the skull model. The display adapter for the left eye (printed mirrored for the right eye). When it came to the assembly, I was placing the eyes in first, fixating them with a bit of hot glue. 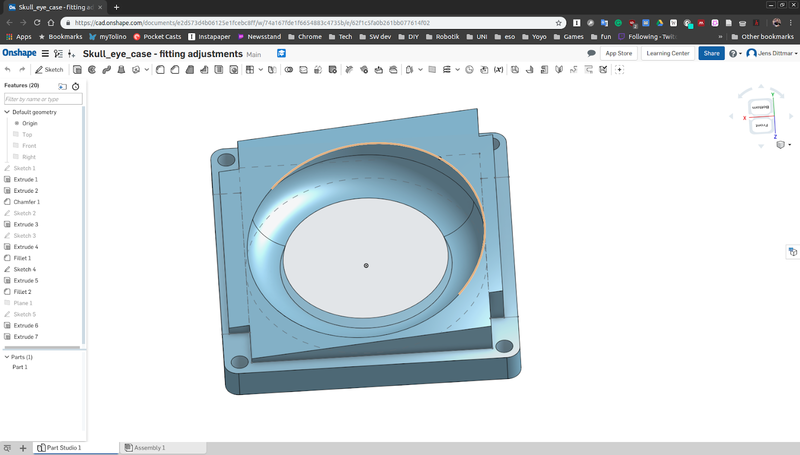 Next, I had to find a place for the Raspberry Pi, which required me to create another adapter as the Pi (in it's printed case) has a flat surface, while the skull inner side is rounded. I created a little piece to glue into the skull so I could place the Pi on top of it. I also designed it in a way where I had holes for cable ties included, so I did not need to glue the Pi in, just in case I want to easily remove it again. The adapter for the Raspberry Pi. 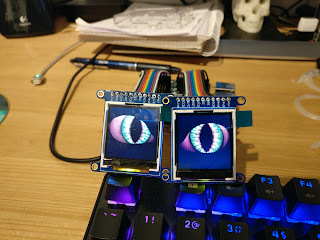 After the Pi was set into place, I connected the Eyes to it. I also placed a small power bank into the skull so I could keep it going for about two hours without a power connection ... when walking around with a skull under my arm. Inner view with the power bank and Raspberry Pi. The eyes (displays) are behind the power bank. 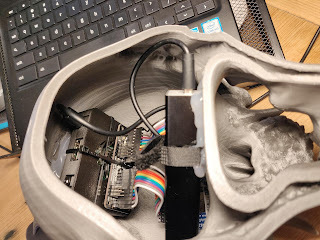 In the end, I was creating a small hole at the back side of the skull with a screwdriver (heating it with a lighter, then just pressing gently through the PLA) to put a micro USB connector into it. This way, the skull can be charged while standing flat on a table. I am very happy how that project turned out and it has been a lot of fun. It's even more fun now to show it around and see the surprised eyes of my colleagues and spectators. It's surely not the cheapest (with about 100 € in materials) but a very fun project and a great decoration object for Halloween. Have a look at the video below to see the skull with animated eyes in action.